Most of them seem off. In the original series the characters grew over time but here there seems to be some sort of race to the finish line in terms of characterization. I mean, the dialog SAYS Willow is plagued by insecurity but she's also proudly out of the closet and running for class office. Both of those things would have been unthinkable before she became a witch and gained some self confidence in later seasons. Cordelia spent most of her time on BtVS pretending to be an idiot. The TV version was mean to everyone until she started dating Xander (she was pretty hostile even after that) and doesn't really warm up until she joins Angel. This new version seems smart and friendly. ... though the scans indicate the last part may be an act. Her being out of the closet I think was a good idea. I don't want them to spend multiple waiting for Willow to come out. it would also be perfectly fine for her to still be filled with insecurities. that's, like, half of Tumblr. I think the issue is that the creative team seems to be running on the "you already know these characters" method of writing. 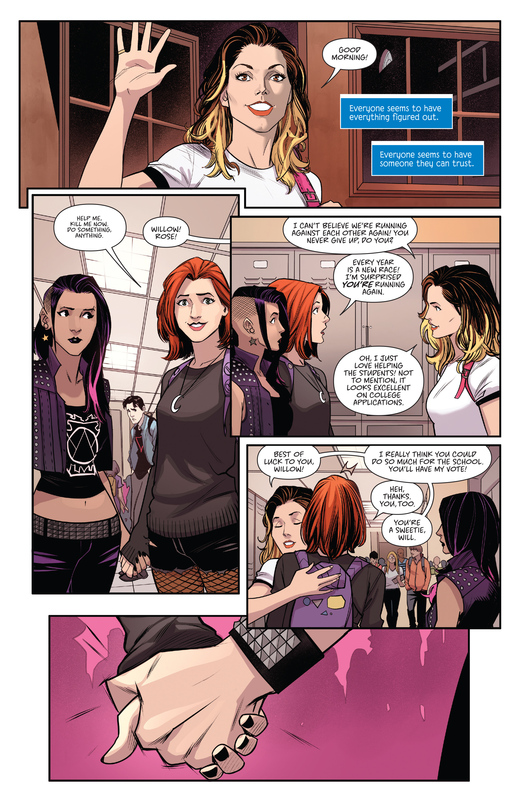 Which is not necessarily a bad idea, since most people picking this up are probably aware of who Buffy is. But it is still... not good. 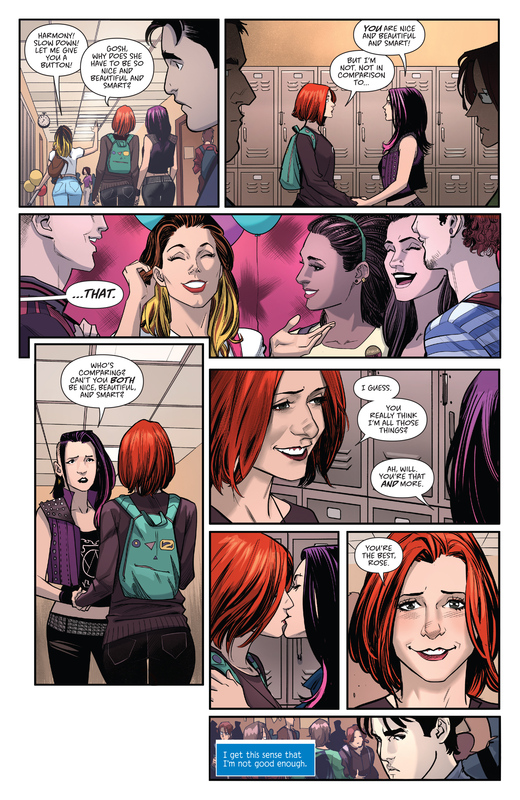 "Her being out of the closet I think was a good idea." Generally I agree .... though I do wonder how they'd handle Oz*. 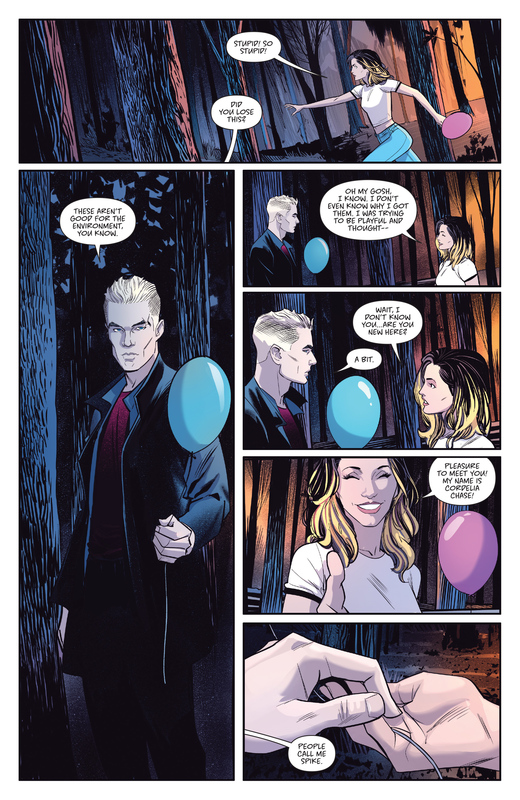 Having personal connections to the core three went a long way toward keeping Angel, Anya, and Oz from being just another monster. Taking part in a school-wide popularity contest seems VERY un-Willow-like though. *Assuming he isn't already there. I mean they have Spike lurking around and this is only the second issue. I was willing to accept this relatively secure, out Willow, but Cordy is where I draw the line. You may as well not even call this person Cordelia. Even THAT Cordy had an edge, the episode "Billy" alone had some cracking Cordelia moments. I like the art, but yeah, that's the only thing I like about this, for the reasons everyone above has given. Even Spike doesn't seem right. Not cocky enough. It's interesting that they've chosen to introduce him before Angel. I wonder if this, along with him not actually attacking Cordy, means that this version of Spike already has his soul back, and that he's therefore meant as a composite of him and Angel. While I can understand why they'd do that -- Spike having long since overtaken Angel in popularity -- I think that too would be the wrong move, yet another "race to the finish line in terms of characterization," as zachbeacon put it above. Yeah I think Spike's not attacking Cordy just because he doesn't want to blow his cover for whatever Dru has him doing. The characters do feel off, but I'm willing to give this some more time to find its feet. High school archetypes HAVE changed somewhat in the last 20 years. A Cordelia who knows you catch more flies with honey's not entirely unreasonable. No real thoughts on this, I just wanted to mention how odd it is to see this coming out when there's supposedly a TV reboot in the works.